Fix bug where Devil Soma Magma Beast was dropping Copper plate item instead of Pills of Dread. Add multi-monitor patch for Windows 10 gdi32full.dll version 10.0.16299.15 and 10.0.17134.112. Fix top left chat and chat history UI not using the available width of the current resolution. 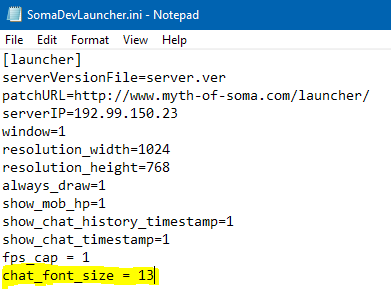 Added a chat_font_size option to SomaDevLauncher.ini to change the top left chat and chat history UI font size. The default is 12. Add multi-monitor patch for Windows 10 gdi32full.dll version 10.0.16299.15 and 10.0.17134.112. .....I do not understand. lol font size grats work loooooooooooool !!!!! @RAINBOW Some players have multiple monitors and client needs to patch code to an issue that causes the client to lag (low fps) but have to do it for every version of the gdi32.dll or gdi32full.dll windows system file. Might of missed something as was banned for a week but what we do with the copper plates we got from mags? Are they useable for devs? Give to human? Or just npc them? Only got 1 so not really a problem for me. Font Size Config... My God You Legend!